Photograph courtesy Roger Geach. 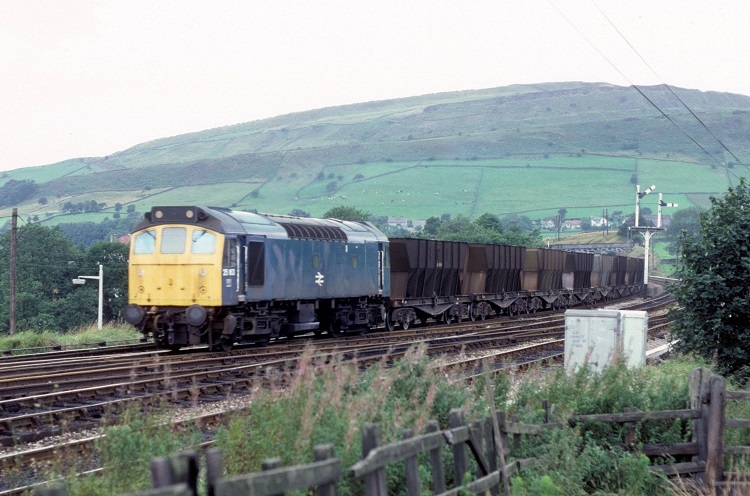 25163 heads east at Chinley North Junction during the late afternoon of September 16th 1980 with another set of ICI empties returning to Tunstead. The sixteen year career of D7513/25163 was spent allocated to a variety of London Midland Region & Western Region depots. Boiler room grilles sheeted over (1979). Time between last Classified repair and withdrawal: 19 months. January 1965 to the Nottingham Division (D16). February 1967 to the London Division (D01). November 1970 to Nottingham Division (D16). 25163 was the 65th Class 25 to be withdrawn, one of seventeen Class 25s withdrawn during November 1980. 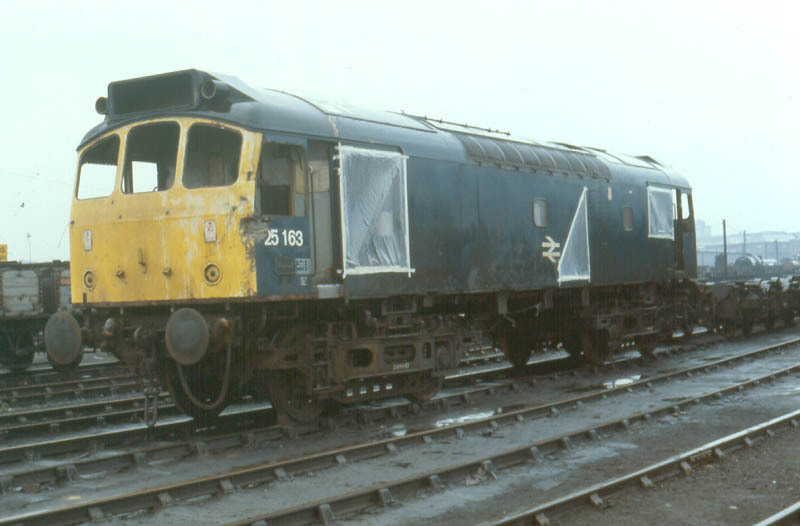 After withdrawal 25163 was moved to Swindon Works on December 19th 1980 and was broken up by the middle of March 1983. Noted Derby Works January & March 1979 (General repair?). Noted Derby Works December 1979 - February 1980 (N4 repairs). The earliest recorded passenger working for D7513/25163 occurred early in its career, working a day excursion on May 11th 1965 with D5291 to the south coast resort of Eastbourne (noted southbound at Hatch End), the train believed to have started at Bradford. During the last days of steam, D7513 provided banking assistance up Miles Platting bank on August 4th 1968 to a Euston - Hellifield 'End of Steam' special hauled by Brittania class steam locomotive No. 70013 'Oliver Cromwell'. On October 19th 7513 was arriving at Cambridge with a Preston - Cambridge parcels. On July 5th 1974 25163 piloted 47046 on the 19.30 Bristol Temple Meads - Newcastle between Birmingham New Street and Derby. An early morning working occurred on August 9th 1975 when 25163 worked the 23.35 Euston - Holyhead forward from Crewe. On July 2nd 1977 25163 & 25264 worked the Derby - Norwich - Yarmouth - Norwich - Derby diagram, a total of 334 passenger miles. Photograph collection of webmaster. 25163 & 24047 in the Chester area during September 1977. 25148 & 25163 arrived in Reading on an engineer’s ballast train on March 16th, surprisingly having brought the train from Bristol, quickly returning from whence they came, light engines. On August 12th 25163 & 25307 worked the 09.19 Manchester Piccadilly - Yarmouth to Lincoln Central, returning with the 09.15 ex-Yarmouth. Four days later 25163 was very busy on the North Wales coast, working two round trip Manchester Victoria - Banger turns on August 16th & 17th, a combined total of 800 passenger miles. On September 12th 25163 worked the 13.30 Manchester Victoria - Bangor. Derby Works yard is the location for 25163 as it stands in the rain during February 1979, whilst receiving its last Classified repair. On July 13th 25163 worked the 17.10 Cardiff - Crewe. During 1980, its last year of service 25163 worked three summer dated seaside services. 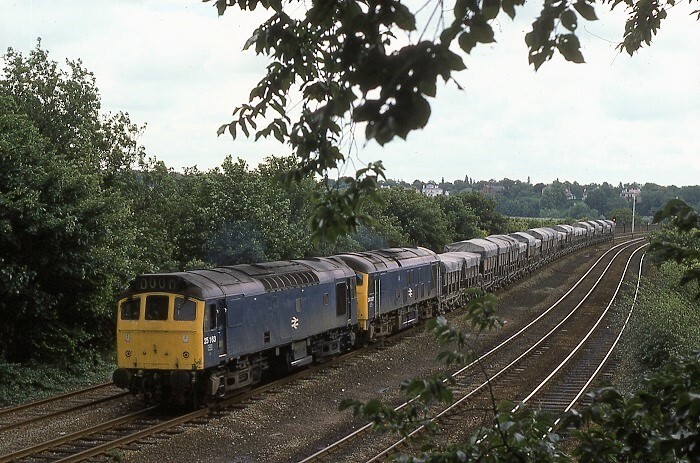 On June 28th 25163 & 25101 worked the 08.56 Stoke-on-Trent - Yarmouth relief to Norwich (did they work back?). A month later on July 26th 25163 & 25143 worked the Walsall - Norwich (for Yarmouth) - Derby diagram. The next day (27th) the same pair worked the 08.25 Leicester - Skegness and 18.30 return. 25163 was withdrawn on November 10th 1980. Since its last Classified repair was early in 1979 it must be assumed the locomotive suffered a serious problem to initiate its withdrawal. Page added March 6th 2013.